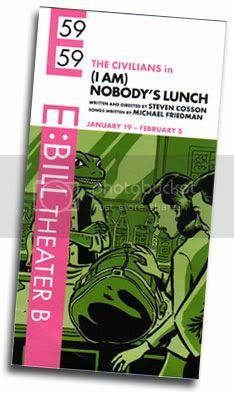 So on Friday night Sari and I attended the premiere of The Civilians’ Nobody’s Lunch, and I finally got to see the promo postcard I did. Turns out they also used my art for the posters advertising the show (one of them was five feet high! ), and for the program. And perhaps the biggest compliment of the evening was finding out afterward that one of the show’s key props — the “suspicious package” — was based on my drawing! I’m tickled to be associated with The Civilians — especially now that I’ve seen one of their productions — and I encourage you to see the show yourself before their limited New York run ends. Sounds great. I’m going to try to get there with my gal pals. Thanks for the tip. Also, kudos for a neat collaboration. I like that about you. Oh… I saw one of their shows and thought it was great. I knew two of the girls who were in it, one very well, but I don’t think she’s in this show. I didn’t know you did their artwork. It’s a frighteningly small world. Thanks for reminding me that I wanted to see this.